I love music but I was definitely not blessed with a musical ear that's able to peel away layers and guess notes from one listen — a conclusion that took an excruciating 7 years of piano and keyboards lessons to get to. However, I am always trying to bring out the engineering mind inside me to figure out the exact way a song is built. That's why I'm fascinated by Google's latest experiment, Inside Music. 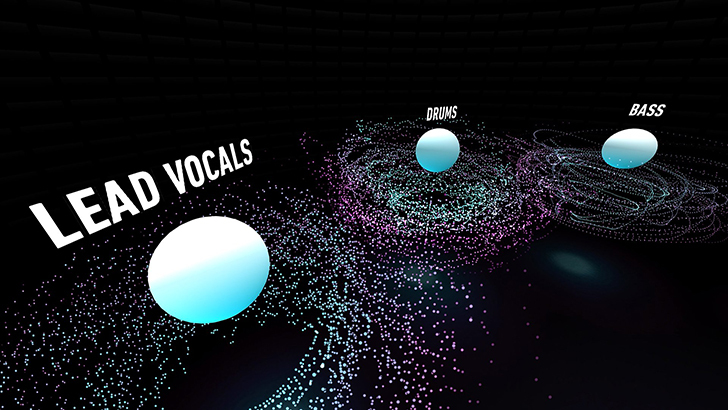 Using WebVR and in collaboration with popular Radiotopia podcast Song Exploder, Google has made a site where you can visualize the layers of 6 different songs in 360deg. It works with VR headsets, but also inside your browser on desktop or phone. Pick one of the songs and bouncing balls appear around you for each of its elements that only activate when said element is playing. You can also control the music by turning off each element to see/hear what the song would be like without it, and even turn off all but one element to focus on it. There's a pause button, but I wish there were options to rewind a few seconds if you wanted to hear something again. Google has also uploaded the code on GitHub so that you can use it to visualize your own songs. To check it out for yourself, head over to g.co/insidemusic.